A still from “Trains at Hayes”, 1935, the first film made with stereo sound. When we describe someone as “forgotten”, we generally mean that they’ve fallen off the publishing schedules for a decade or two. No more than that: it’s publishing’s survival as a career choice for the British upper middle classes that’s made it possible for a James Lees-Milne to stay on Waterstones’ shelves while an Alan Blumlein hasn’t. But I assure you that Alan Blumlein has played a far greater part in your cultural life than Lees-Milne. And he hasn’t been forgotten: the gatekeepers to British publishing can’t forget men they’ve never known enough of to remember. To be fair, there was a minor flurry of publishing interest in Blumlein in 1999 – you’ll find details at the end of the post – but nothing to match the Whittles or the Turings, and unless you have a professional-level interest in sound recording, you probably ended that year as uninformed about Blumlein as you began. But if you’ve listened to music in stereo – and you probably have – Blumlein invented that. Or watched television – which might have happened – Blumlein demonstrated widescreen hi-def stereo TV in 1936. Or voted in a democratic election since 1945 – Blumlein’s radar inventions were instrumental in beating off the U-boats, defeating the Luftwaffe’s night bombing campaign and in taking our own bombers into Germany in World War II. Or if you own one of those new sound bars that fit discreetly underneath flatscreen televisions – Blumlein invented single-speaker stereo – then you owe all or part of that to one of the United Kingdom’s great autodidacts. Because Blumlein didn’t learn to read until he was 13. By 20, he had a registered patent, a first class degree and an academic post. He’d be given another 18 years on earth, and there’d be another 127 patents. Blumlein is alleged to have come up with the idea of stereo while watching an early talkie movie with his fiancee. As Singing in the Rain makes abundantly clear, microphone placement in early sound film left plenty to be desired: wherever an actor was on screen, his voice came from the same “place” aurally as everyone else’s. Blumlein is said to have turned to his fiancee on the way out and declared that he knew a way to “make the voice follow the actor” onscreen. 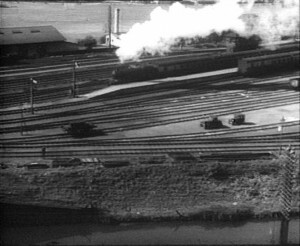 True or not, nevertheless stereo sound and stereo film is Blumlein’s and Britain’s: the first stereo film in history shows Great Western Railway traffic passing through Hayes station in 1935. The clip isn’t online, but a videotape of it is held by the Alexander Palace Television Society. The BBC have a charming clip of Blumlein’s stereo film experiments here. The British Library National Sound Archive have some astonishing stereo clips of early Blumlein recordings here, including this one of a news report of 1930s trade union negotiations being read mischievously over some swing jazz and a classical piece. Blumlein was killed in an air crash over the Wye Valley in 1942 aged 38, testing the HS2 air intercept radar system. In life, he was supposedly difficult, short with people he thought lacked “first class minds.” It doesn’t matter now. When we get our Turing ten pound note, let’s spare the twenty for another of the great Britons whom we’ve been careless to remember. Or whom some of us have been careless to remember: these Bournemouth University students haven’t, and this is a hugely charming and effective summary of the life of a magnificent man. The Alexandra Palace Television Society has an excellent Youtube channel full of the unexpected – not the Hayes film yet, unfortunately. Great post, I remember a programe about Blumiein years ago, it may even have been a schools program. I knew of his achievements but had forgotten his name. Your right, we shouldn’t forget about such great people!